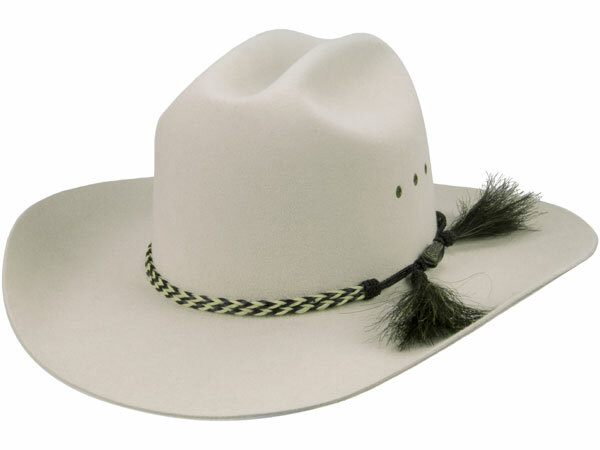 An American hat shape with an Australian name underlies the frontier heritage shared by both nations. On either continent, a wide brim and tall crown will serve you well in the great outdoors. The pre-creased crown with a center crease and side dents is a shape often found in the American West. A horse hair band finishes the hat. It is 5 inches high at the front, 5-1/2 inches at the sides, with 3 eyelets on each side. The brim is 4 inches wide, raw edge. Premium quality pure fur felt, fully lined. Reeded roan leather sweatband. Made in Australia.